It was a gorgeous Friday afternoon in Sydney. The sun reigned supreme, unhindered by clouds, browning the bodies of all who dared to walk under it unbathed in sunblock. Rong had wanted to meet Jeremyville since she had discovered his work in LA, and as the fates would have it- he was living right in Bondi! So armed with their sketchbooks, nectarines and cake, Rachel and Rong set off to meet the wizard. After an hour and a half journey, their trek was rewarded with coconut juice and a lovely afternoon of art and conversation! They had never been so impressed by how humble an accomplished man can be! To forever immortalize the afternoon, the trio decided to combine all their powers. 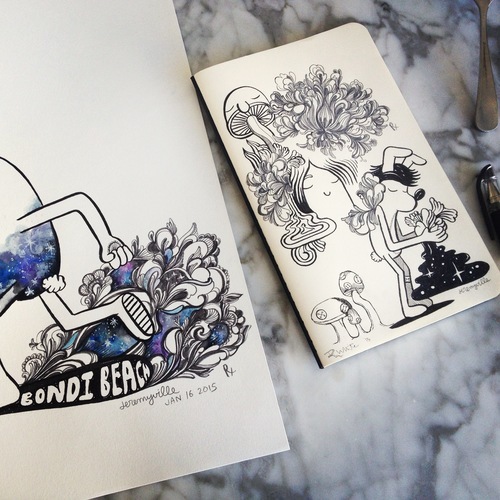 First, Rong and Jeremyville did a Bondi-Inspired Collaboration. Rong filled in the inside of the ears and the paws of the Jeremyville citizen with floral doodles, placing behind him a puff of galaxy dust. Next, Rachel and Jeremyville added mushrooms and magic to a floral sphere that Rong drew. The outcomes of combing different styles were pretty awesome. Rong and Rachel left that day inspired. They knew they had to forever remember that.. Thank you Jeremyville for being an awesome host and gracious artist! You're the best- a toast to new friends!